Does Checking Your Credit Hurt Your Credit Score? The first step in any credit-related goal is to get your credit score. Are you thinking of checking your credit, but worried it may hurt your credit score? If so, you’re not alone. The idea that checking your credit negatively affects your credit score is a common belief — but rest assured, it’s false. Read on to find out more about checking your credit and the impact it has on your credit score. Does checking your credit score hurt your credit? Not always. Do you know what your current credit score is? As we mentioned, the first step to any credit-related process is knowing and understanding your credit score. Checking your own credit score is safe, in that it doesn’t harm your score, but not all inquiries are the same. The fact that checking your own credit doesn’t hurt your score is great news, since research has shown that regularly monitoring your credit can help lead to a higher score. In other words, not only will checking your credit not hurt your score, it can actually help you improve it. Improvements aside, let’s take a closer look at why understanding the process of checking your credit is so important. Why is checking your credit score important? Many of today’s consumers believe that checking their credit will have a negative impact on their score. As a result, a large number of consumers tend to avoid regular credit checks, meaning that many people may be missing errors or inaccuracies on their report — which can lead to a lower score. As such, it’s important for you to regularly check your credit to stay on track and make sure your score is where you’d like it to be. 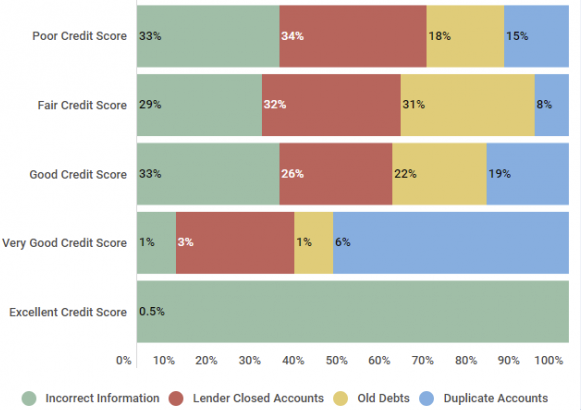 Here are the biggest factors in inaccurate credit reports, broken down by credit ranking. As you can see, incorrect information impacts a number of consumers — even those who currently have a good credit score (33%). Source: Credit Sesame surveyed 250 people, 50 had a poor credit ranking, 50 participants had a fair credit score, 50 members had a good credit rating, 50 people were listed as very good, and 50 members reported they had an excellent credit score. The study was conducted October 20, 2017 over a period of two weeks. When it comes to monitoring your credit, it’s important that you fully understand how to check your credit. To help with this, we’ve broken down some of the most common misunderstandings about how to check your credit, including what goes into your credit score, the difference between hard and soft inquiries, and more. 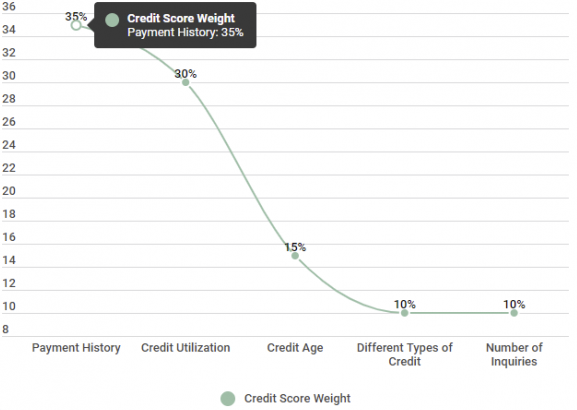 First things first, what exactly is your credit score, and how it is calculated? Your credit score is a numerical reflection of the information that is found in your credit report — or a representation of your ability to repay a debt as agreed. It can also show your use and responsibility with using credit. In other words, it’s a simple number that carries a lot of weight. Payment history.Your payment history has the single biggest impact on your credit score of all factors. Always make at least the minimum payment, and make all of your payments on time each month. Credit utilization.This is simply a fancy term for how much of your available credit you’re currently using. For the best score, you should aim to keep this number at or below 30%. Some experts even suggest trying to stay below 10%, although this can sometimes be difficult. Length of credit history.The length of your credit history also factors into your score. Always keep your oldest accounts open and in good standing. Types of current credit.Creditors and lenders like to see responsible use of a mix of credit types. If you only have credit cards, consider adding a credit builder loan. Similarly, if you only have something like a student loan on your credit report, consider applying for a credit card or store account card. Account inquiries.The number of credit inquiries for your account can also impact your score. As we’ve mentioned, soft inquiries (when you check your credit yourself) do not affect your score, but a hard inquiry, such as when you apply for a new credit card, does. Limit the number of your applications to help you achieve your best score. Let’s take a closer look at just how much each of these factors can impact your score. The only category above that could possibly be impacted by checking your credit score is account inquiries or new credit opened. As you’ll notice, the bulk of your credit score factors reflect more on your responsible use of credit — paying your bills on time, being responsible with the amount of credit you use, and being able to handle different types of credit (e.g., student loans and credit cards). Related to " Credit Score Check "
Did you know that there are different kinds of inquiries when it comes to checking your credit? Hard inquiries, also known as hard pulls, are the kind of inquiries that can cost you points on your score. This type of inquiry occurs when someone pulls your credit to make a decision about whether or not to extend credit (or even additional credit) to you. Keep in mind that these types of inquiries should never happen without your consent, knowledge, or approval. If you see hard pulls on your credit report that you are not familiar with, contact the credit bureaus to make sure they are indeed something you requested. FICO, the originator of the most widely used and recognized credit scoring model, says that a hard inquiry may cost you up to 5 points using their system. VantageScore, FICO’s main competitor, takes hard inquiries more seriously — indicating that this type of pull could cost your score as much as 20 points. By contrast, a soft inquiry or a soft pull is when you check your credit score, or when a lender is looking to pre-approve you for a loan or a credit card. These types of inquiries have no impact on your score. So what’s the bottom line? Several hard inquiries at once, such as from applying for a number of credit cards at the same time, can have a significant impact on your credit score. And keep in mind that any hard inquiry will stay on your credit report for 2 full years — although any impact the inquiries have on your score will fade much sooner than that. Here’s how those inquiries impact your credit score. WIth 4 hard inquiries in 90 days, you could expect your credit score to drop by more than 50 points. By contrast, the same number of soft inquiries doesn’t affect your score at all. Don’t let this stop you from shopping around when seeking a new car loan or a mortgage loan. If you have several hard pulls all for the same product, such as a car loan, within 14 days, they will all only count as one pull. This is to allow the consumer make a good financial decision without feeling pressured to go with the first lender they speak with. There are several different kinds of credits scores, often with many different versions. When you’re monitoring your credit, make sure that you’re checking the same credit score, as well as the same version of it, each and every time. This way, you’re making sure that you’re comparing apples to apples. While credit scoring models mostly measure the same things, different versions may weigh items differently or may use a different scale. You don’t need to purchase identity theft protection or expensive credit monitoring services to see an accurate report of your score. There are several ways to get your credit score for free, including many credit card accounts and bank accounts. It is recommended that you check your score regularly, at least once a month (keep in mind that you can do this for free with Credit Sesame). Credit Sesame also provides free credit monitoring for its members. We interviewed Amanda on June 10, 2018; She is 34 years old, is married with two young children, and is a homemaker in Tacoma, Washington. What have you found the most helpful when checking your credit score? My husband and I have been looking at buying a new house, especially now that the kids are getting a little older and we need more space. When we first applied for a mortgage, my credit score came back so bad, we couldn’t qualify. That is when I found Credit Sesame and my credit score was available every time I logged in. It is great because I don’t have to jump through any hoops, and if something is confusing, it is explained. They helped me get my score higher by clearing off two inaccuracies, and we are closing on the house tomorrow. What would you recommend to someone who is new to checking their credit score? First don’t let what happened to me to happen to you. Get on Credit Sesame and get your credit score. Once you have that, you can click through the different Credit Score factors. There is information about how to make your credit score better within each factor. We know you hear it over and over, but the truth bears repeating — your credit score and your credit health play a huge role in so many aspects of your life. Knowing how to correctly check your score will give you a regular and accurate snapshot of your credit health, which can help with everything from saving money on your credit cards to qualifying for a mortgage to purchase your dream home. Checking your score regularly is one of the most effective ways to stay on top of the necessary steps to maintain or even improve your credit. So, does checking your credit score hurt your credit; it depends! To recap, the most important takeaway here is that checking your credit does not hurt your credit score. There is a difference between hard and soft inquiries — hard inquiries happen when you apply for a new line of credit, and a soft inquiry is when you check your own credit. Soft inquiries don’t affect your credit score, but hard inquiries can lower your score from just a few points to sometimes many more. Checking your credit is an important first step to maintaining good credit health. Checking your credit score regularly can be a good indication if something is off in your credit report. Before you apply for a loan for an expensive item, such as a car or a house, it’s smart for you to be aware of what potential lenders will see when processing your application. Knowing where you stand gives you the chance to shape up your credit, if necessary, before submitting your application.